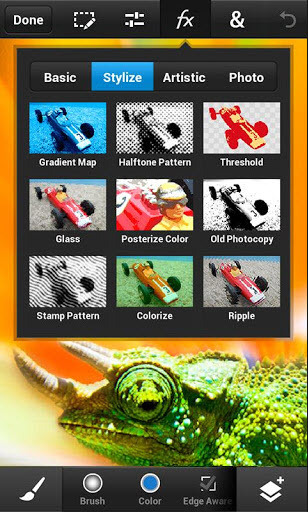 Adobe has released Adobe Photoshop Touch for Android and iOS smartphones. Supports layers, selection tools, adjustments, and filters. precise tone and color adjustments to your entire composition, a particular layer, or a select area. graphical text,Apply strokes, add drop shadows and fades, and more. device’s camera to fill an area on a layer with the unique Camera Fill feature. Start a project on your phone and finish it on your tablet or back in Photoshop at your desk using a free membership to Adobe Creative Cloud. Your projects are automatically synced between your devices. Free membership to Creative Cloud provides 2GB of cloud storage. Work on high-resolution images while maintaining the highest image quality. Images up to 12 megapixels are supported.